Explore the Monterey Peninsula and California's breathtaking coast from our hotel in Carmel, California. 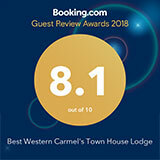 Located less than a mile from Pebble Beach Golf Course and scenic 17-Mile Drive, Best Western Carmel's Town House Lodge makes it easy to experience the Central Coast of California. Our hotel is just a few miles from the shops and restaurants in the village of Carmel-by-the Sea, as well as Old Fisherman's Wharf and historic Cannery Row in Monterey. Take the kids to the Monterey Bay Aquarium or set off on a whale watching adventure on the bay. Spend the day touring the wineries of Carmel or exploring Point Lobos State Nature Reserve, with a stunning landscape of headlands, coves, meadows and hiking trails. There's plenty of things to do in Carmel near our hotel so go explore. Head south on Fred Kane Dr toward Olmsted Rd. Continue on Olmsted Rd. Turn right at Monterey Salinas Hwy. Take the ramp onto CA-1 S/CA-68 W.
Continue to follow CA-1 S. Turn right at Ocean Ave.